Knife Attack did not lead to Mirza Mahmud's Mental Issues? 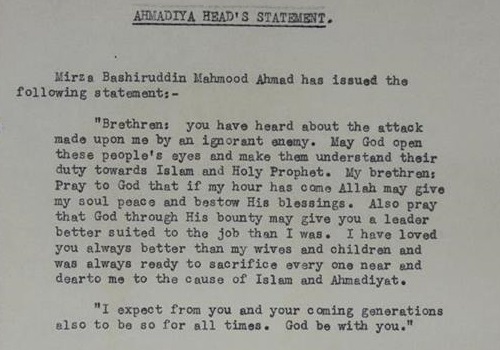 Home / Ahmadiyya Jamat / Knife Attack did not lead to Mirza Mahmud’s Mental Issues? 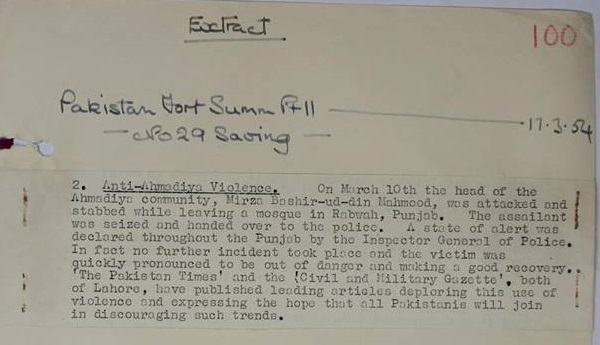 Recently, we have come across some news clippings and intelligence assessments from 1954 that report on the knife attack on Mirza Bashiruddin Mahmud Ahmad, the Second Qadiani ‘Khalifa’. 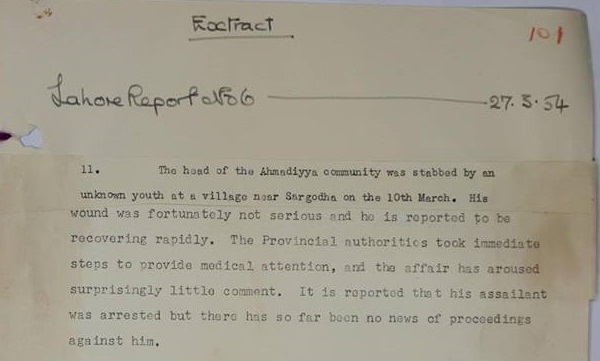 These show that although murder was attempted, the wound itself was minor and Mirza Mahmud was out of hospital the next day, and did not even go to a large facility or abroad for treatment. After recovering partially, he traveled to Europe for further medical and surgical treatment due to constant discomfort and unease. Briefly staying in Lebanon, Mahmood Ahmad travelled to Switzerland via Athens and Rome. He continued travelling and received some medical treatment in Zurich, Hamburg and London. After consulting with his doctors, it was concluded by that the tip of the knife had broken and embedded itself in the jugular vein and that no attempt should be made to remove it. As more facts come to light, this official story seems less and less likely, as any tip of the knife would have been visible in X-rays and he should have gone to Lahore or Karachi for more diagnostics. Also, why did he visit so many cities for such a straightforward issue? And a ‘metal tip in the jugular vein’ could be removed and would only have caused physical pain instead of interrupting his writing and speaking career. He also lost overall command of the Jamaat, resulting in his sons Mirza Nasir, Munawwar and others becoming very powerful. 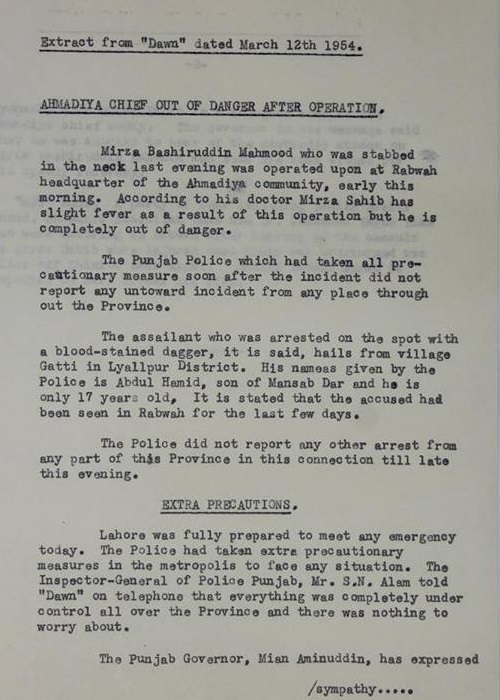 This lack of command resulted in the ‘un-grounded’ Mirza Nasir becoming Khalifa after his death and led to misguided policies and political adventures that resulted in Ahmadis being declared non-Muslim for purposes of the law in Pakistan. 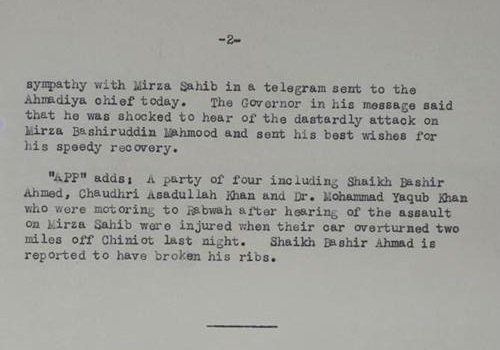 After analyzing the excerpts below, the Lahori version of his illness is more believable: that he suffered from neurosyphilis towards the end of his life. That would explain the official as well as the rumoured symptoms. If anyone has any articles, pictures etc. from 195-1965, please let us know. The more information we have, the more we are able to form a better picture of these last 10 years of Mirza Mahmud’s life.